“I can’t believe it went so fast?”; “Brilliant, but it was over in a flash!”, “Can’t remember much about it”. If you ask any couple how their wedding went, these are the responses you’ll get with a can’t-believe-it shake of the head. I got married last year and guess what, WHOOOSH! and that was with the benefit of thousands of weddings under my belt and knowing what to expect (not my own, as a piper). 8 o’clock, What already?! !…panic!…no it’s OK…rings and marriage schedule are still tied to my big toe. Breakfast on the go…9 0’clock What?!! already! Drive to hotel…schedule and rings getting in the way of the accelerator. “Thanksh for coming” x 50. Take notes…aye right! Ok ok, joking! Take it easy on the bevvy…aye right!. I’ll move on. I have to confess not following my own advice, although I didn’t set out to get smashed either. Ok, the serious ones now! The 3rd suggestion, is possible for Scots (unlike no 2) and that is to make sure that lot’s of people (especially teenage kids) have cameras and that they snap away at candid moments. Consider supplying disposable cameras, this way you can piece the day together by post match analysis. Finally, don’t try to pack too much into the day! Guests don’t need continuous activities. A nice setting, a refreshment, nibbles and some good company are enough for any soul! I do have one vivid memory and that was my continued surprise at friends from abroad, walking into the village pub, where I was having lunch prior to the wedding ceremony. “oh look, it’s such-and-such, what are they doing here?…oh yes my wedding”. Numpty! 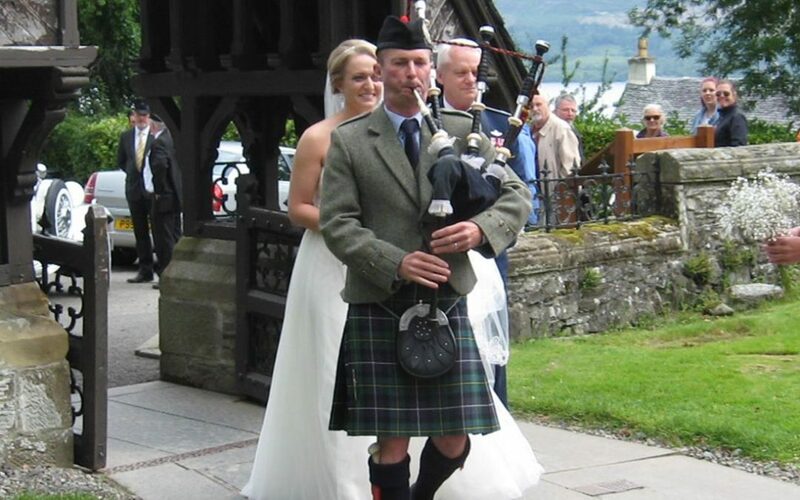 Time is the enemy!…Advice from a Scottish wedding piper on planning the big day! I’ll give some pointers on how to keep your wedding on schedule.